Get all the daily fantasy information you need on the Valspar Championship right here. A handful of the top players in the world will continue their Florida swing this week at the Valspar Championship. Innisbrook Resort at the Copperhead Course will host the event once again, which is located in Palm Harbor just northwest of Tampa. To put it simply, the details of this event are much different than last week for daily fantasy folks. While the best players in the field include names such as Adam Scott, Jordan Spieth and Henrik Stenson, the overall depth of this tournament is much weaker than a WGC event. We are going to have to dig deeper to create our lineup. So, what are the other differences? There will be a 36-hole cut. We want to make sure we use a balanced-salary method to ensure we get scores from everyone through Sunday. 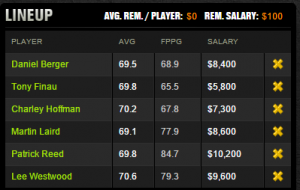 DraftKings also got back on track with their salaries for each of the players. Our odds per dollar page is up to date, but quite frankly, it won’t come in handy too much this week. What’s the next step to get an edge? Let’s figure out the details of the golf course and the tournament. The winner is typically somewhere between 7 and 15-under par. The weather this week is supposed to be in the 70s with only 5-to-10 MPH winds. We should see something easily in double digits this week. Innisbrook is a par 72 at 7,340 yards. There are four par 5s – No. 1 (560 yards), No. 5 (605 yards), No. 11 (575 yards) and No. 14 (590 yards). In examining the results over the last five years, approximately four eagles are made on each hole for the entire tournament. That’s not very many for a field of 144 players. No. 1 is a slight double dogleg, and that hole will usually yield the most eagles. No. 5 plays uphill, and that’s the toughest to make a three. No. 11 is reachable in two, but it’s a wicked dogleg left to a small green, so you particularly see a lot more birdies than eagles. No. 14 has a forced carry over water and has the biggest bunker on the course to the left, so not many players like going for it in two. Essentially, length is key. We need the points from the eagles. These par 5s are long, and the closer the players are to the hole, the more likely they will go for the green in two, especially since hitting a long iron or utility club into these greens are a lot easier than just ripping a fairway wood. Even though none of the par 4s are drivable, you can learn more about Copperhead here. Therefore, we want to find guys who have great driving distance, are high up on the birdie or better percentage list and are playing well as of late. Daniel Berger $8,400 – 15th in driving distance, 23rd in birdie or better percentage and has three top 10s in his last four events. Tony Finau $5,800 – A little bit risky here, but tied for sixth in driving distance, 12th in birdie or better percentage and has made eight of his 11 cuts this year (the three missed were by a combined five strokes). He’s also barely missed several eagle attempts, which is why his FPTS per game is only 65.5 with these stats. Putting has variance. 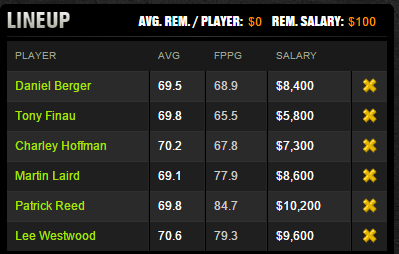 Charley Hoffman $7,300 – Hoffman was my fill-in play. He’s 37th in driving distance, 35th in birdie or better percentage and he’s only missed one of eight cuts since October. Martin Laird $8,600 – He’s tied for 32nd in driving distance and tied for sixth in birdie or better percentage. Laird has finished tied for seventh, tied for fifth and tied for 15th in his last three tournaments. In his seven events for the season, he has five top 20s and three of those are top 10s. 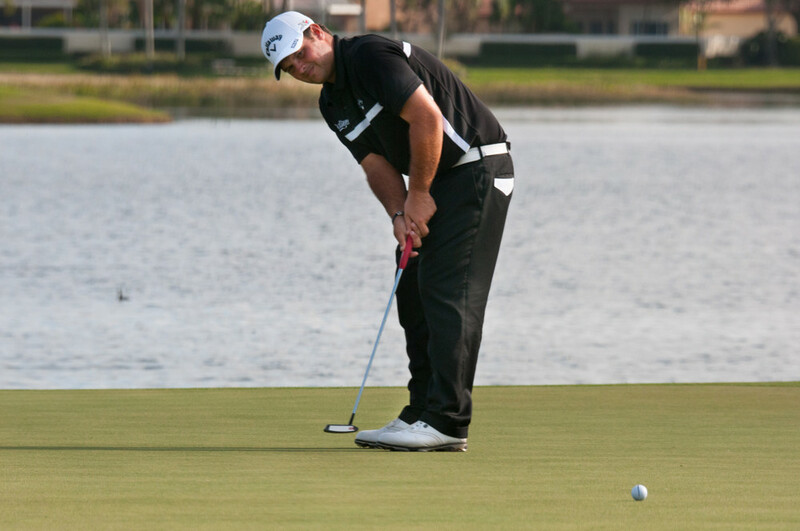 Patrick Reed $10,200 – Reed is tied for 72nd in driving distance and 34th in birdie or better percentage. However, few of the top-tier golfers are long hitters this week, Reed hasn’t missed a cut all year and is capable of winning anytime he hits the links. Lee Westwood $9,600 – Very quietly, Westwood is off to a hot start this year having made all nine of his cuts between the PGA Tour and European Tour. All of those finishes have been no worse than tied for 25th. Plus, don’t be fooled by Westwood at age 41. He’s 40th in driving distance at 296.5 yards and 14th in birdie or better percentage. New to DraftKings? For only $27, you can enter DraftKings the $110,000 Fairway, a fantasy golf tournament that awards $10,000 for 1st place! And if you sign up through this link, you’ll earn a 100% bonus on your first deposit! DFS NBA 3/11: Should You Play Russell Westbrook Tonight?